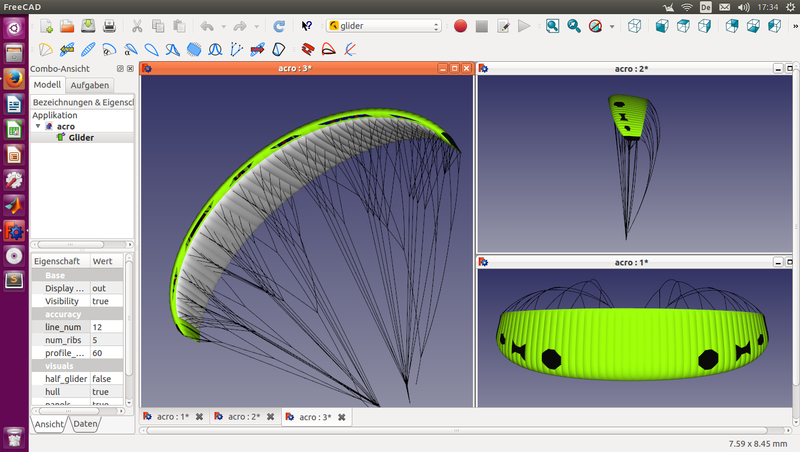 Announcing the glider workbench, a gui for OpenGlider in freecad. Development is still ongoing, but I thought it is time to show the development state. If someone is interested in testing or developing I can give instructions on how to install OpenGlider and this workbench. At the moment, I'm not interested in it, but it' cool anyway. I wonder, how many purpose-specific workbenches are out there. Thanks for the replies. I will post updates, but the development will take time. And at the moment it isn't sure which front end we will choose. We do not use many things from freecad right now. Mostly the workbench uses pivy and qt. But as I have seen some fem visualisation tools arriving and the latest calculix has announced to support membrane elements, there will be some good things we can use from freecad. Does anyone know if occ has some functionality to unwrap develop able and non develop able surfaces? This would be another useful tool for us. I load this file to get the __file__ variable then I have to load tools . Can you check it for your? If you commit it into your git - the workbench is integrated. In my case it is working because I have the freecad_glider directory inside of /usr/lib/freecad/Mod which is in my case part of the sys.path. but I will change this soon. As I have already said in another topic, I am not happy with the freecad way to add python modules. I think this has to be fixed. A solution would be to not add every package to the python path, instead only add the base directories (/usr/lib/freecad, /home/.../.FreeCAD/Mod). + changeing the shared objects to _package.so and import them in the __init__.py of the package. looo wrote: As I have already said in another topic, I am not happy with the freecad way to add python modules. I think this has to be fixed. A solution would be to not add every package to the python path, instead only add the base directories (/usr/lib/freecad, /home/.../.FreeCAD/Mod). + changeing the shared objects to _package.so and import them in the __init__.py of the package. Yes, I agree. As the number of workbenches increases there will come conflicts. My idea was to put the extra modules (macro collections into a subdirectory where I can manager the __init__.py). But for workbenches the users want to have in the workbench list. I think there should be a discussion continued to get a robust redesign that allows the integration of community workbenches with clear defined namespaces. There are still some small problems - see this thread above.